I have included the signals on this page just as a souvenir, without intending to give more information on them. As I have time, I will provide links to sites giving information, if available. 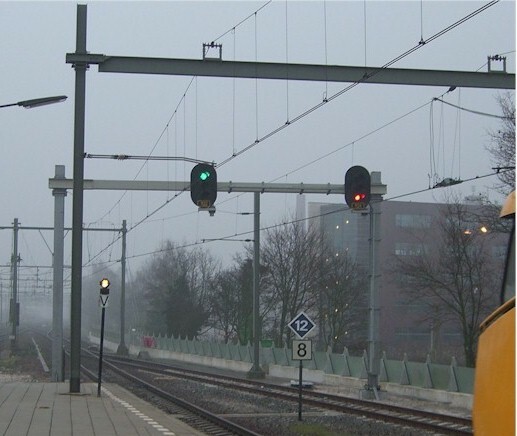 Here you see a number of Dutch signals. On top there are two main signals, one displaying clear and one at danger. The white light above the "V" board is a proceed indicator. It tells the platform staff that the exit signal shows a proceed aspect and that the platform staff can issue a departure order signal. The blue diamond is a stop board, it orders that the head of a train with (in this case) 12 cars must stop here. The white board with the "8" is a speed limit execution board limiting the speed to 80 km/h.